iPhone price in US now higher than in UK after EU vote | What Hi-Fi? The falling value of the pound following the EU Referendum vote means for the first time in years it isn't cheaper to buy Apple products in the US. 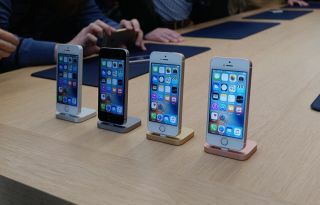 Holiday-makers looking to pick up a bargain iPhone or iPad in the US are out of luck for now, as uncertainty surrounding the value of sterling has seen the price of an iPhone in the US overtake the price in the UK. Financial market uncertainty following the UK’s vote to leave the EU has seen the pound fall in value compared to the dollar. As a result, the traditional savings when buying electronic items in the US have been wiped out. And it could mean we’re set for a price rise in the UK. The Telegraph reports that an entry-level iPhone 6S bought in New York would now cost £544.04 based on current exchange rates, compared to £539 in the UK. Earlier this year the same iPhone would have been almost £50 cheaper in the US, while five years ago the saving would have been around £150. Similarly, the cost of an iPad bought in the US would be higher than in the UK, whereas back in 2014 it would have been some £100 cheaper. As a result, Apple could raise the UK price of its next iPhone, due for release this September, should the value of the pound continue to drop. And it won’t be just Apple, of course. Other US companies are also likely to raise their UK prices to bridge the deficit left by a falling pound - indeed, computing firm Dell has already announced it will be doing just that.